For the past few months Batman and Superman were the talk of the town, the movie was quite poor but then along came the highly anticipated Supergirl/Flash crossover. We've just seen this episode over here in the UK and it was the perfect pallet cleanser after the Batman VS Superman movie. 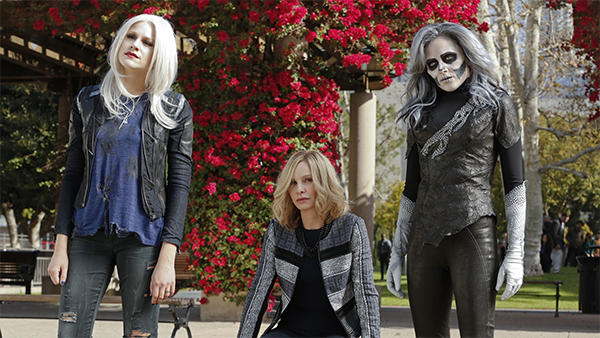 As well as the Flash, Silver Banshee finally makes her debut a few weeks after her alter-ego Siobhan Smythe appeared. Unlike a lot of people, I really liked her new look, she also teams up with early Supergirl villain Livewire and the two go out with the intention to get revenge on Cat Grant and Kara/Supergirl. We also see Siobhan come to terms with her new screaming powers and we learn about her family curse. It was the most original origin story but it did the job. I was glad that the episode didn't linger on it and let the action unfold pretty quickly. I also really liked how The Flash was introduced! With Kara literally hurled out of a window, it made perfect sense for it to be Barry Allen who caught her otherwise she would have to give away her secret identity. I also really liked how the Flash music kicked in at that moment and continued to play whenever he did something heroic. It just goes to show how synonymous it has become with his character. Grant Gustin and Melisa Benoist had a great chemistry that really aided all their scenes. I was also relieved that for once, the two of them didn't duke it out before they could introduce themselves properly. Instead, both of them listened to one another and the pair became fast friends and helped each other out instantly. Even the slight bit of exposition explaining how Barry got to Kara's world was entertaining to watch and it was helped along when he was introduced to Kara's friends Winn, James and Cat. Indeed, those early scenes were some of the best moments in this episode and I especially enjoyed Cat saying the name The Flash sounded like "someone who jumped out of ally's in a trench coat" and calling the gang "the racially dynamic cast of a CW show!" 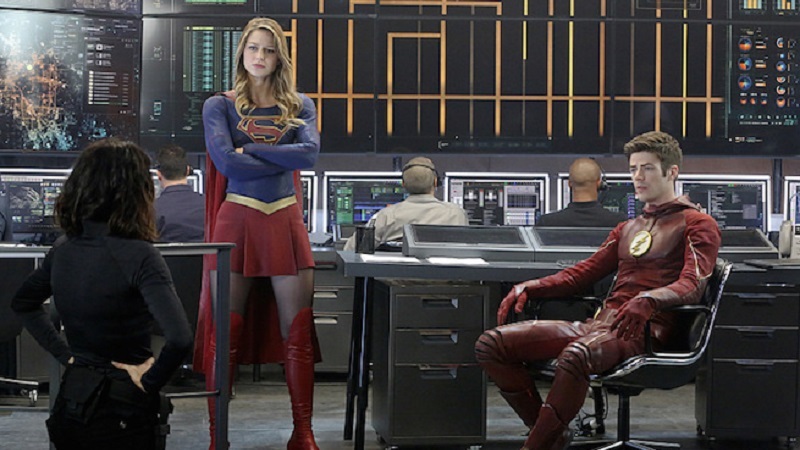 What also came across in this episode is that The Flash seems to suit the Supergirl world better than he does in Arrow or Legends of Tomorrow and if it weren't for the fact that the counterparts from both shows didn't exist in each other's universe, meaning that the cast from The Flash didn't exist in the Supergirl universe, it would have come across as they were both in the same universe. In fact, it is a shame that they aren't in the same universe. I would have liked to hear news presenters on in the background on Arrow talking about a mysterious woman who can fly, neatly setting up a crossover that way! Both Livewire and Silver Banshee made good foils for our heroes in this episode. People weren't crazy about Silver Banshee's new look as she did admittedly look like a day of the dead fanatic, I think it looked pretty scary, lets not forget, she is supposed to be based on the mythological Banshee of Irish origin. And, while The Flash's first battle with Livewire was a little silly, the final battle between the four of them was another highlight. But this episode also struck something of an emotional chord. A couple of episodes ago, Kara was infected with Red Kryptonite which made her go a little crazy and hurt the people of National City. I have to admit, I thought after the events in that episode it would be a little while before the people of that city forgave her but, when push comes to shove at the end of this little escapade, the people of National City stand up for her and protect her using themselves as human shields to save her against the combined might of Livewire and Silver Banshee. It was also nice to see Kara getting saved by the fire department who zap Livewire of her electrical powers by dowsing her with a firehose. Alright I didn't get chocked with emotion at that moment but it doesn't make a lot of sense that the people of National City would be so loyal to Supergirl at that moment considering what terror she had unleased on them. That element did feel a little rushed as I feel it should have been a more powerful moment in the first season. Here it does feel a little weak. But that quibble aside, this episode delivered the goods on almost every single front. I really like the ending with a little race between the Flash and Supergirl and although we didn't get a definitive answer to who was fastest, it will keep fans guessing. Also a good moment was the kiss between Kara and James, while I haven't been too invested in their relationship it does set events up nicely for the next few episodes which will form the finale for the first series and I came away from it feeling that this episode was a triumph all round.